Ottawa Humane Society: Hop on down to the OHS for our free family Easter egg-stravaganza! Hop on down to the OHS for our free family Easter egg-stravaganza! Is there a hop in your step now that spring is finally in the air? 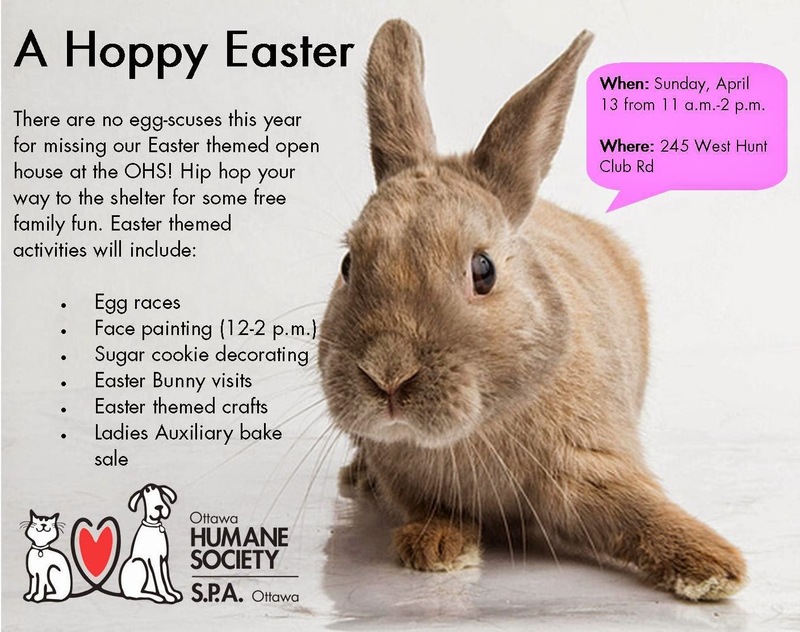 Grab the kids and hop in the car for some egg-citing free Easter fun at the Ottawa Humane Society. You and your family can eggs-plore all of our furry friends and join in the fun. We’ll be offering free Easter-themed activities such as egg races, face painting, sugar cookie decorating and tons of Easter crafts. The OHS auxiliary will be holding a bake sale where you’ll find some scrumptious treats. And you never know if our good friend the Easter bunny will make an appearance! Our Off-Leash Camp counsellors will be on site to answer any questions you may have about our children’s programs including summer camp, birthday parties and tours. Come celebrate spring at the OHS Hoppy Easter event. There are no egg-scuses to miss it! Let's Close the Species Gap!